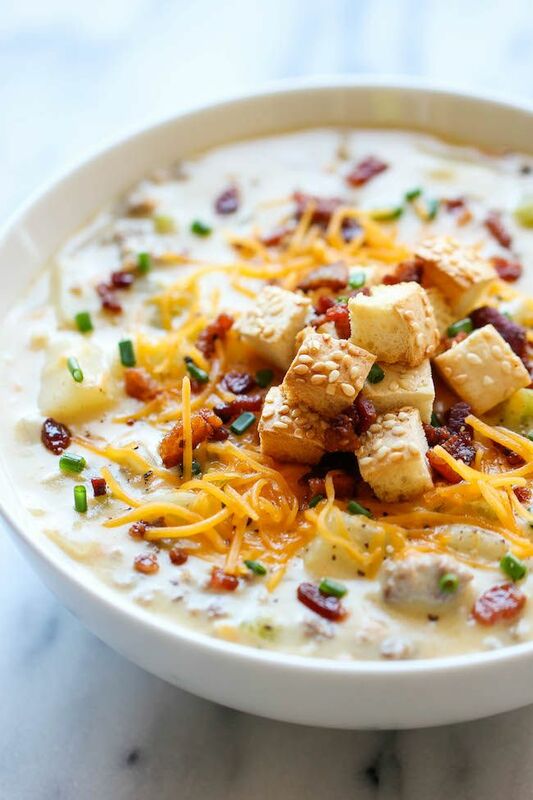 A delicious soup that will thrill any cheese lover! Fry bacon until it starts to crisp, and then add onion, celery, bell papper, and carrots. ; add garlic a little later. Continue cooking until onions are clear and the bacon is crispy. Add flour, stirring constantly for 2 to 3 minutes. Add green chilies and 1 cup of the chicken stock; then transfer all to a food processor, puree the mixture, and return to pan on stove. Stir in cream, remaining 2 cups of chicken stock, cream cheese, Velveeta, (and white cheddar if not using bread bowls); stir until melted. Bring to a boil, cover, and simmer for about 20 minutes, stirring occasionally. Remove from heat and stir in mustard, cayenne, Tabasco, Worcestershire Sauce, and Fajita Seasoning. In the bottom of a Bolillo Roll or bread bowl, place a layer of the shredded white cheddar cheese, and then top that with the soup. Sprinkle with Parmesan Cheese, and top with bacon, croutons, and green onions, as desired. If not serving in bread bowls, the white cheddar can be added at the same time as the other cheeses. This wine pairs wonderfully with Peach Creek Vineyards Sassy Lassy or Tropical Bliss. Recipe adapted from several on the internet.